Whether you require routine maintenance or your air conditioning unit isn't functioning properly, our HVAC service specialists can help! Our team will make sure your unit is perfectly clean and running optimally by the end of the day. Read on for more details on our service. Due to constant use, you’ll eventually find your HVAC system in need of repair. It could be a relatively minor problem with one of the filters or a more serious one with the boiler. Air filters can become inefficient due to the accumulation of dust, debris or other particles that block their well-functioning. When that happens, they urgently need a repair done and more than often a full-on replacement. When it comes to the latter issue with the boiler, this is more common in older systems, but you can rest assured our team will know what to look for and what to do in order to have it fixed as soon as possible. Filter replacements might seem like small and insignificant tasks, but they could lead to bigger and more expensive problems if not taken care of properly and timely. Delaying or neglecting to change your HVAC filters could cause the system to get clogged up. This could result in the loss of airflow or other conditions that trigger your system to work harder to maintain a cool or warm home. In most cases, this leads to the need for more expensive repairs later on. Replacing your filters about every three months will help keep your system running smoothly and for longer. With our team at your service, you won’t have to worry about getting the right size and type of filter. Our technicians will take care of it all in one visit! Along with ensuring your HVAC unit is properly cleaned, it’s also highly important to make sure the air you breathe indoors is free of harmful pollutants. Our air quality test includes checking for allergens, mold and carbon monoxide. In case any abnormalities are found, you can choose to have your ducts inspected and cleaned then and there. Our technicians will clean and sanitize every corner in order to make sure they are free of any mold and bacteria. 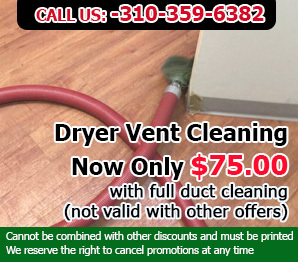 Call our team at Air Duct Cleaning Redondo Beach today if you need any help getting your HVAC unit, ducts, or kitchen exhaust hood professionally checked and cleaned! Our team is at your service and ready to answer any question.